Art from The Sandman #19 by Charles Vess. Gobbledygeek episode 188, “The Sandman: Vol. III – Dream Country (feat. Greg Sahadachny),” is available for listening or download right here, and on iTunes here. A dream is a wish your heart makes, or so the song goes. What happens when that wish is fulfilled? Neil Gaiman has a few answers in The Sandman: Vol III – Dream Country, wherein a writer finds his muse, cats rule the world, Shakespeare puts on a play, and an immortal prays for death. Paul and AJ get back on track with their year-long Four Color Flashback exploration of Gaiman’s masterpiece, this time joined by The Debatable Podcast host Greg Sahadachny. Plus, Joss Whedon turns 50, Tim Burton’s Batman turns 25, and How to Train Your Dragon 2 has something to say about strong women. 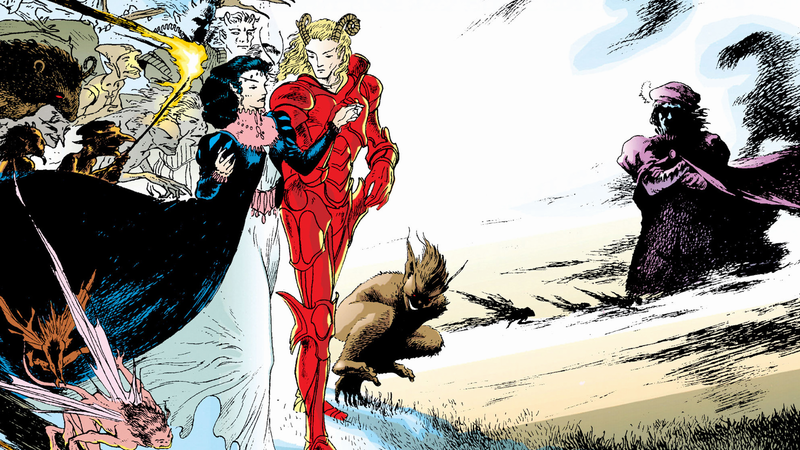 Next: doubling down on our Four-Color Flashback with another trip to The Dreaming, as Eric Sipple joins us for a discussion of The Sandman: Vol. IV – Season of Mists. This entry was posted in Four-Color Flashback, Shameless Self-Promotion and tagged auberon, batman, charles vess, comic books, comics, dc, dc comics, dream, fantasy, film, gobbledygeek, graphic novels, gregory sahadachny, how to train your dragon, how to train your dragon 2, iibsyn, itunes, joss whedon, literature, morpheus, movies, neil gaiman, podcast, puck, sandman, television, the sandman, tim burton, titania, tv, vertigo, vertigo comics. Bookmark the permalink.